Doris Dexter was born at 22 Lovatt Street in Stafford on 20 February 1897, the third child of Alfred and Emma Dexter. The census of 1901 shows the family now living at 23 Ruby Street in Leicester. By 1902, when her brother Harry was born, they had moved to 79 Sylvan Street in Leicester and in 1905 when brother Harry was born they were still in Leicester but at 40 Marfitt Street. The family made the decision to emigrate so, in September 1906, Doris's father sailed over to Canada to look for a place to settle. On 13 June 1907, Doris was with the rest of her family on board SS Southwark, leaving from Liverpool and bound for Quebec, where they arrived on 23 June. They then proceeded to Hamilton in Ontario to joined her father. The family were living at 216 Wood Street in Hamilton when her brother Charles was born in 1908. Doris married James Wilson, known as Jim, in Hamilton on 2 September 1914. The census of 1921 shows the Doris and Jim living at 61 Barnsdale in Wentworth County, Hamilton. They had sons Murray and Dennis. 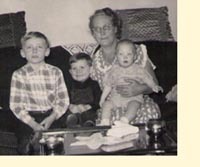 Doris and Jim made several trips to England during which time they visited their niece Dora Smith and her family. They used to send parcels to niece Doady and her family each Christmas. Doris passed away in May 1973 Columbus and her funeral was held on 19th of that month as recorded in a telegram to her niece Doady Smith in England.